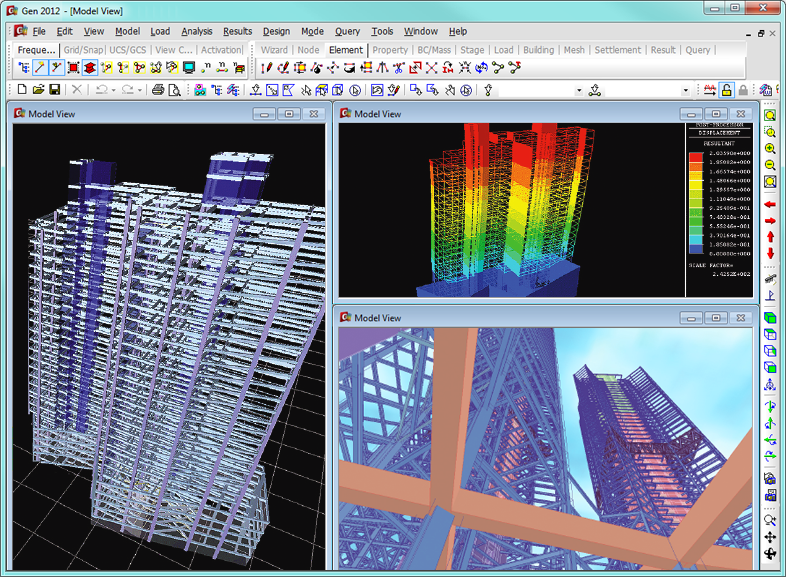 With its intuitive user interface, contemporary computer graphics and powerful solver, midas Gen enables practicing engineers to readily perform structural analysis and design for conventional and complex structures. midas Gen utilizes a diverse range of specialty finite element analysis functions as well as modern theories of structural analysis to render accurate and practical results. These features contribute to higher and unprecedented standards of convenience, efficiency, versatility and productivity for structural design. Modern structural design codes require that a diverse set of analyses be performed to meet local design standards. Although many structural software programs have been developed to aid with these various analyses, they are often incapable of handling every analysis type that is required. This has caused many engineers to rely on multiple specialized programs and systems. 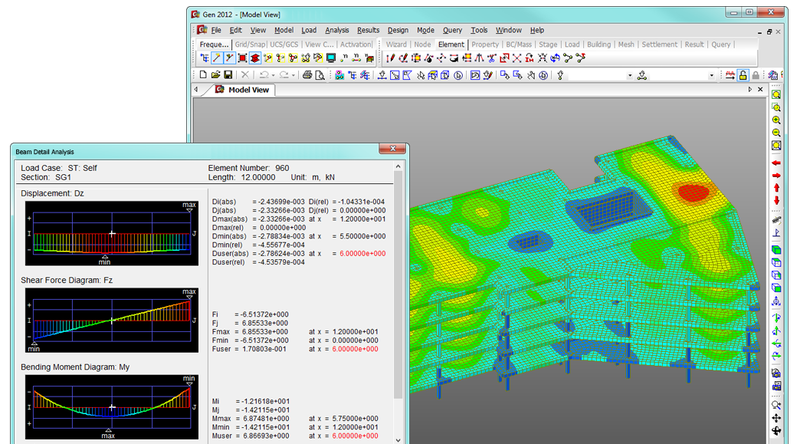 One of midas Gen's most powerful advantages is its ability to handle the full spectrum of structural analysis types. midas Gen's capabilities include: construction stage analysis for the study of time dependent material properties and construction sequences, p-delta analysis for the calculation of secondary moments and deflections, buckling analysis for calculation of failure modes and compressive strengths limits, and material nonlinear analysis for displacement limit checks. midas Gen is also equipped with advanced functions for seismic analysis. It is equipped to perform pushover analysis as well as conventional response spectrum analysis and high-end time history analysis. Thus it is the software of choice for structural engineers in seismic regions. Lastly, you can apply midas Gen not only for buildings, but also all types of structures such as industrial plants, stadiums, gymnasiums, airports, and social infrastructures. midas Gen's remarkable analysis versatility ensures that you will be able to handle any type of structural design project that you will encounter. Many leading engineering firms have used midas Gen to expand the scope of the types of projects they pursue. It has also been used as their primary tool for structural analysis, thus enabling them to efficiently provide uniform training for engineers. This has made it much easier for engineers to work together on a single universal design platform as opposed to several specialized and incompatible programs. In today's market, it is essential for engineering firms to be proficient with sophisticated finite element analysis software to create optimized designs and proposals and to competitively bid for projects. midas Gen contains a large selection of design functions that will enable you to determine the critical displacements, bending moments, and shear strains that are needed to create the most optimized and cost effective designs. midas Gen is used for the design of all structural elements including beams, columns, slabs, walls, and footings. The program has an extensive database of RC, Steel, and SRC design codes which can be used to automatically check for failure and over-conservatism in your designs. Specialized functions are available for the design of member sections, footings, meshed slabs, and capacities for steel elements and concrete structures. These functions take the inputted design and loading parameters into account to calculate the optimal section shapes and arrangements. High-end design functions such as these differentiate midas Gen from all other finite element modeling software. These functions make it possible to create highly accurate optimized designs at an accelerated rate without the need for an in-depth understanding of finite element analysis. The modeling of complex structures on 3D finite element analysis software can pose a variety of difficulties. 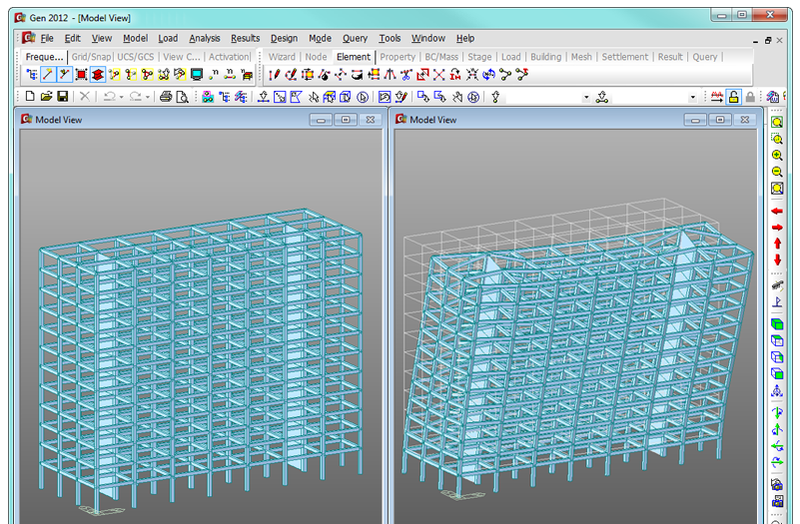 Much time is often spent redrawing projects that have already been modeled on building information modeling programs. The modeling of various loads, irregular sections, construction stages and multiple stories can also require many repetitive and time consuming steps, especially for programs that only have standard modeling commands. midas Gen has one of the most advanced and modeling interfaces in the market. It is fully compatible with other building information modeling programs so that you can directly import drawings and data into midas Gen instead of having to redraw them. Building generation wizards are available to aid in the modeling of frames, arches, trusses, plates, shells, beams columns, tapered sections and multiple stories. Functions for simulating all load types including seismic, floor, beam, thermal, prestressing and hydrostatic pressure are included to simplify the modeling process and to generate accurate results. Construction stage modeling functionality enables you to simulate highly detailed construction stage sequences and alternate designs complete with temporary support structures and time dependent material property changes. midas Gen features a merge model file option to streamline the consolidation of separate model files. For example, several engineers can simultaneously work on their separate parts of a project and then seamlessly merge the individual files into a single file. These highly developed commands enable engineers to save significant amounts of time and effort, especially for complex and large scale projects. The post-processing speed of finite element analysis software becomes increasingly important for projects with higher levels of complexity and larger amounts of input data. A slow processor can lead to significant amounts of time lost in waiting for the results to be generated, especially when it is necessary to run the analysis multiple times to take design changes into account. midas Gen has the fastest multi-frontal solver and the latest analysis algorithms, instantly bringing accurate and practical analysis results. In particular, the dynamic analysis and nonlinear analysis speeds are remarkably fast. The post-processor generates an in-depth reporting of key results including story drift for static and dynamic seismic loads, story shear for response spectrum and time history loads, and story shear force ratio for columns and shear walls. The post processor also performs checks for irregularities in torsion, stiffness, weight, and capacity to ensure that design code standards are met. midas Gen's advanced processing speed and detailed result generation will ensure that you will be able to quickly calculate and verify your desired results and stay on the project schedule. In addition, the powerful graphic displays allows for fast representation in analysis results in contour model, graphical, and spreadsheet formats. The result displays can be easily transferred to Word documents so that final reports can be efficiently organized.